Our Fast Plants are shrimpy. I have been eliminating variables all week. 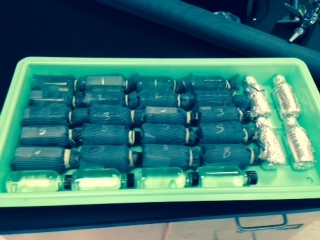 The final straw was replacing the 40 watt 4′ bulbs with 40 watt grow bulbs. I would have preferred 32 watt bulbs because they are cooler, but I have a fan running so that should help. So, I have 6 40 watt 1600 lumen bulbs on the plants and you can see the spectrum difference by looking at them lit up. I hope this is the variable that when changed, makes a big difference in our plant growth. I had Gro Lux bulbs in and I am not sure they have the plant specific spectrum I needed. It’s like Asia said, “Only time will tell.” I just quoted Asia. 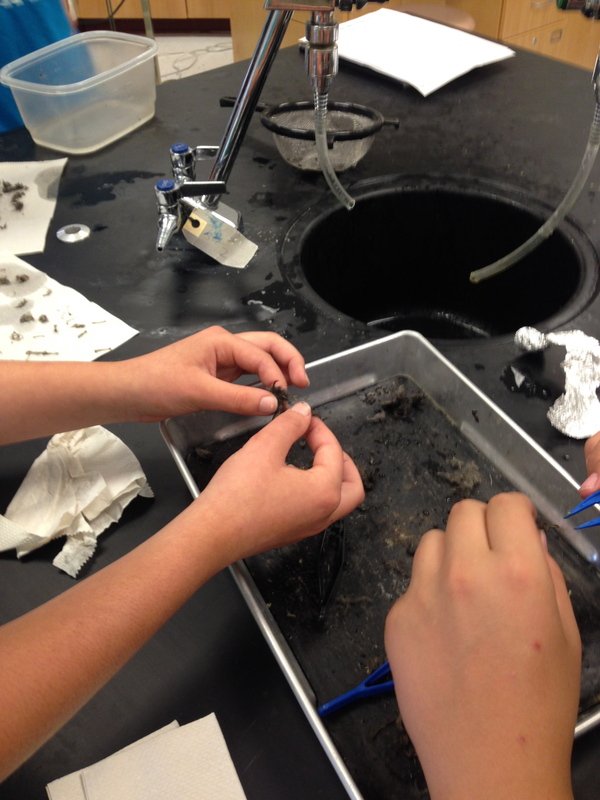 In honors we wrapped up the bone ID portion of the lab and tomorrow we will move on to the trophic analysis portion. We will look at this as a class first because the spreadsheets tend to scare off the freshmen. Back in 1992 i was doing my masters thesis field work on St. Catherines Island off the Georgia coast. It is an uninhabited island for science and historical research and only accessible by boat. On the island (not many people know) the New Your Zoological Association runs an endangered species preserve. So, lots of organisms that have lost their habitat make the island home. 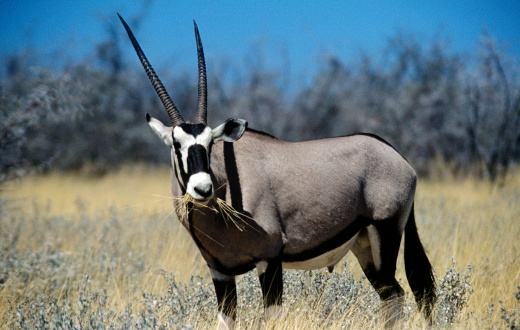 There are zebra, macaque monkeys, lemurs, giant tortoise, all kinds of birds, and a lot of herding African animals. On the days where the salt marsh tides did not cooperate with my field work, I got to tag along with the zoologists and one of the things we did was drop food. They were looking at some zebra and i was watching the gazelles come up the path for food in single file. The one in front stops about 50 yards from me. It had some pretty large horns that went straight up over the head. It began lifting one leg up and down, almost like a bull would before a charge. After a few moments, I decided to do it too. So both of us standing in the middle of a savanna lifting our legs. The zoologists laughed and made sure I knew I was doing the mating ritual of the gazelle. I always tell that story with behavioral isolation since obviously the gazelle female thought I was pretty hot, but alas we were both confused to what the signals meant. Tomorrow we will work on the Lozos lizards short film and virtual lab which should be lots of fun. This entry was posted in Uncategorized on September 30, 2014 by Bob Kuhn. Once upon a time our system decided that science kids needed to have unit by unit performance assessments that demonstrated learning outside of a traditional test. For our first unit (Ecology) in honors biology the owl pellet is the featured choice. I tried to revamp the lab this year for honors as a niche characterization derived from the pellet that incorporates energy calculations and trophic level predictions. Better than just picking bones out of a pellet. At least I think so. 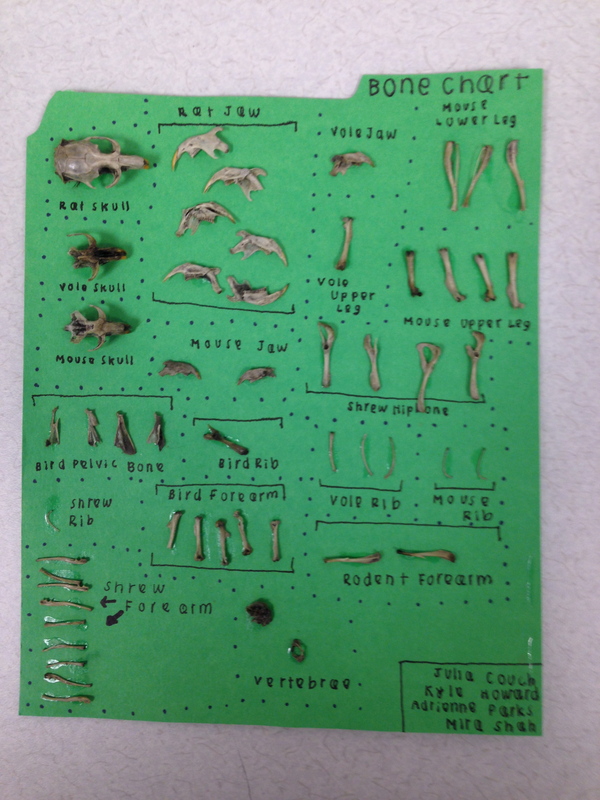 So, today…kids picked bones out of a pellet. They will glue these bones on a “bone card” and ID the anatomy of the prey. Fro here, we will use class data to predict the energy budget for the owl and the trophic system of the area in which they live. In AP biology I gave the first of 4 30-day summative tests. Basically 26 multiple choice and 2 short answer questions. Tomorrow I AP it is on to speciation and one of my favorite activities: Lozos Lizards! This entry was posted in Uncategorized on September 29, 2014 by Bob Kuhn. I grew the Fast Plants over the summer as an experiment to work out the bugs for this fall. No doubt I am limited by light intensity. Over the summer I had 4 florescent grow bulbs (2′ each) and got spindly plants. 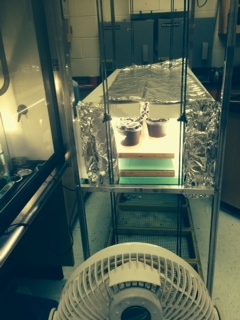 This fall we are on Day 7 and our plants are small and getting spindly with two 4′ light banks of 40w each. So, in reading up on the light manual for Fast Plants, it seems that 8 banks of lights are perfect to get short, robust plants that yield lots of seeds. What to do? This afternoon at 4pm on a Friday (yes I was a bit obsessed), I dismantled the light bank and ended up making a make-shift 4′ light box with 8 bulbs of 40w each. Two of the lights will be too low to yield significant light so it is really 6 lights and some change. I have no idea if this will help. Science! I have a fan going in case it gets too hot in there. I used foil to trap light as well. The plants are around 5cm from the light. I was getting readings around 900 FC at 10cm and at 5cm 3.2 KFC so hopefully some good growing power. Hey, it’s Friday let’s see what happens over the weekend. Hero or goat? This entry was posted in Uncategorized on September 26, 2014 by Bob Kuhn. Today was challenging since our system is having daily internet issues. Rarely do I put all of my eggs in one basket and have online labs for the main course, but I did today and barely made it work. In honors biology the kids had a short lecture (15 min – I set my watch) on population growth. Then we went to the computer lab to use one of the Pearson Biologylabsonline modeling applets to model changes in a bird population. Kids got to adjust population, food amount, clutch size and other variables. The graphs are wonderful and the model is well received. Day 2 tomorrow. In AP biology we started our protein BLAST lab where we look at the amino acid sequences of organisms and use the universal protein database (www.uniprot.org) to search for common molecular homologies. The kids do an guided inquiry first, choosing one relationship to examine and then later will do an open inquiry forming their own question and claim. We had some trouble with the phylogeny mapping software but it seems to be working now. I was interested in the evolutionary history of flightless birds and whipped up this gem comparing the Hemiglobin subunit alpha protein. I was a bit surprised by the results since I thought the African and Australian birds would be closer in relatedness. It leads to a great discussion on biogeorgraphy and common ancestry. Let’s hope tomorrow is internet highway and not internet parking lot. This entry was posted in Uncategorized on September 25, 2014 by Bob Kuhn. Today in both classes we used POGIL inquiry lessons. In both classes I introduced student roles for the POGIL assignments. I laminated these on cards and had them at each table. Kids will rotate each POGIL so they can take on different roles. Out of around 110 honors kids, only two sort of goofed around with their role. They really liked the structure and they collaborated better than before. The AP kids did not get into the roles as much but I do think they see the value. They got a short lecture on phylogeny and then we launched into the group work. It was day 5 of the fast plant planting. Over the weekend we miscalculated the water and some reservoirs went dry. We have about 90 sprouts now which will be more than enough. I have a fan on them and a light as close as I can get. Tomorrow is a challenging day because our school schedule is changed for graduation writing exam testing. Pretty much only 25 minute classes. perfect for some reassessment but I’d rather have the 52 minutes. I plan on dedicating the rest of the week in AP biology to the phylogeny BLAST lab and in honors a population ecology modeling activity and food chains. This entry was posted in Uncategorized on September 23, 2014 by Bob Kuhn. 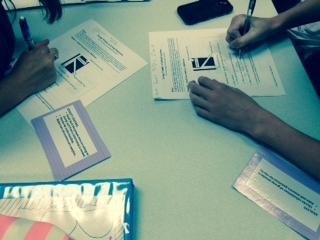 Today in honors biology we talked about models, their limitations and their strengths. Then we reinvented the old AP biology DO lab for an exploration of NPP. It was the first time using CBLs and DO probes and I was less than overwhelmed. Probably just as erratic as the Winkler method. But we got data and judging by the standard deviations of the 4 class data, if nothing else we were consistent. The bugbear will be the analysis on Monday considering my students accept nothing less than perfect data. 🙂 We will discuss what they think is “supposed to happen” and what really did. It is always fun for me, having at one point in my life a huge data set that my professional life depended on and not having a clue to what it meant (initially). 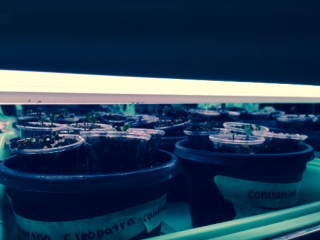 In AP biology we planted seeds for the artificial selection lab. The kid were into it and felt like it was near to “real biology”. We planted almost 70 plants which i think will be enough. They liked the premise of the lab but were not so confident in their ability to keep up with watering and being an overall farmer. Tomorrow is test day for both classes so maybe I will drop some philosophy. This entry was posted in Uncategorized on September 18, 2014 by Bob Kuhn. Today in honors biology we discussed energy transfer in ecosystems and trophic levels. The kids worked through the Energy Pyramid POGIL in 15 minute increments and we discussed at the end of each increment. The POGIL was perfect for the learning objectives and my new active learning set up really emphasizes the sharing spirit of the POGIL modeling technique. In my room right now I have 4 experiments going at once. I am at capacity. We have three long terms experiments and one short term. The long term experiments are the desktop ecosystems, Winogradsky columns and Artificial Selection and the short term experiment is the Aquatic Primary Productivity lab. I have 3 sets of light banks going on as well. In AP biology today we also did a POGIL but in the middle of a short lecture on homologies. I lectured for 20 minutes with Q and A mixed in, and then we did a short model of structural homologies. Tomorrow we will plant our Fast Plants and work on the molecular clock assignment. This entry was posted in Uncategorized on September 17, 2014 by Bob Kuhn.